I found that when I send messages to my Gmail users, I don’t always get the accurate reports. Why? If you use Firefox, you can see the secure/non-secure icon at the bottom of the window. 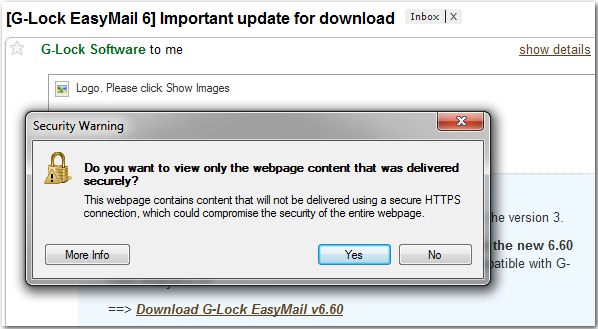 So, to save your Gmail users from this nasty warning, consider hosting your images on a secure server. A post on the Microsoft blog says: “Something to note is that the dialog does not prompt if you’re on an HTTP page and you request HTTPS URL”. This means that secure content loading on a non-secure (http) page will not prompt the security warning message. It seems this solves the problem in Gmail and allows the recipients (Internet Explorer users) viewing your emails with images with no troubles in AOL, Yahoo, Hotmail, and other webmail accounts. When you use a redirect script on your site, G-Lock Analytics automatically checks if your site supports HTTPS protocol or not. If it does, G-Lock Analytics will use HTTPS protocol to track opens. If your site doesn’t support HTTPS protocol, G-Lock Analytics will track email opens in a usual way. In this case, some email opens may not be counted because of the Gmail image handling issue. I found that when I send messages to my Gmail users, I don't always get the accurate reports. Why?